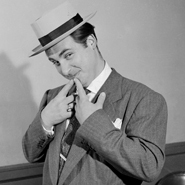 Isaac Sidney "Sid" Caesar learned his trademark accents growing up in Yonkers, New York. Caesar began his career as a stand-up comic in the Catskills. During World War II, he served as a musician in the Coast Guard and performed comedy acts for soldiers. After the war, he appeared on his own television show, Admiral Broadway Revue, alongside comedian Imogene Coca. From 1950 to 1954, Caesar starred in Your Show of Shows, a pioneering television variety show that displayed his talents. He began Caesar's Hour in 1954. This one-hour, all-live sketch show parodied movies, theater, and television and is recognized as one of the best comedy shows in television history.